"Welcome Back ... To Great Tasting Beef!" WE RAISED THE STEAKS...(literally), I enjoy telling people the story behind where their food comes from. When you go to the store, you don't know where a package of rolled oats comes from. I can tell you that this grain comes from our farm, and I could offer you ground beef and tell you which animal it was. Eating and supporting local is not only keeping your money local, but it's also a quality issue with the freshness of food. My philosophy on food is that we should have the best we can get or afford . In Canada, we've got good clean land here, we have different standards and our food is safer. We have all the attributes for good quality food. We do grow the best here and we should be buying locally because of it. Our family operates a closed Hereford cow herd calving annually. Located approx. 60 miles north of Edmonton just off of the Ft. McMurray highway, we are part of the lush semi-wooded Parkland Region which surrounds our farm. Our pastures and hay lands are pesticide and herbicide free. 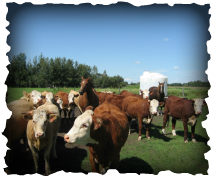 The beef animals we raise from birth are hormone and anti-biotic free. We also practice responsible farm animal care and follow humane livestock management and handling techniques. If you have any questions, please contact us. Also visit our Blog and keep up-to-date on current news.